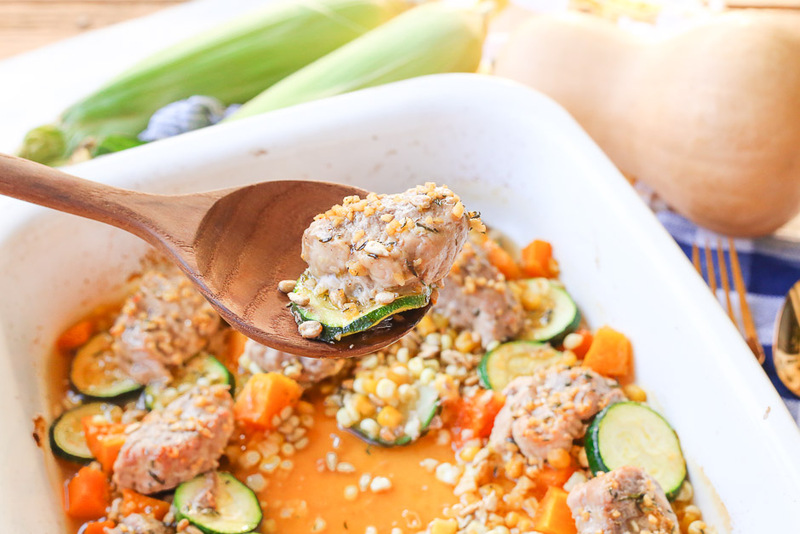 Roasted honey garlic autumn pork and vegetables is a quick and easy weeknight meal prepared in about 30 minutes with real flavor real fast! Honey garlic sauce is drizzled over seasonal vegetables and juicy pork medallions and sprinkled with sunflower kernels! I love making dishes from scratch this time of year. The end-of-summer vegetables are still available and the fall squashes are starting to show up in abundance. It’s the perfect time of year to play with fresh vegetables and juicy meats. 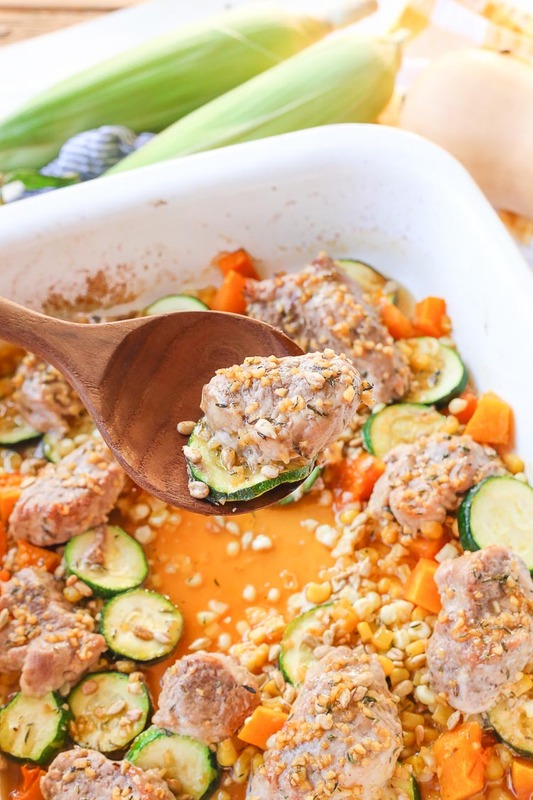 This roasted honey garlic autumn pork and vegetables dish is the perfect combination of big flavors made really fast. 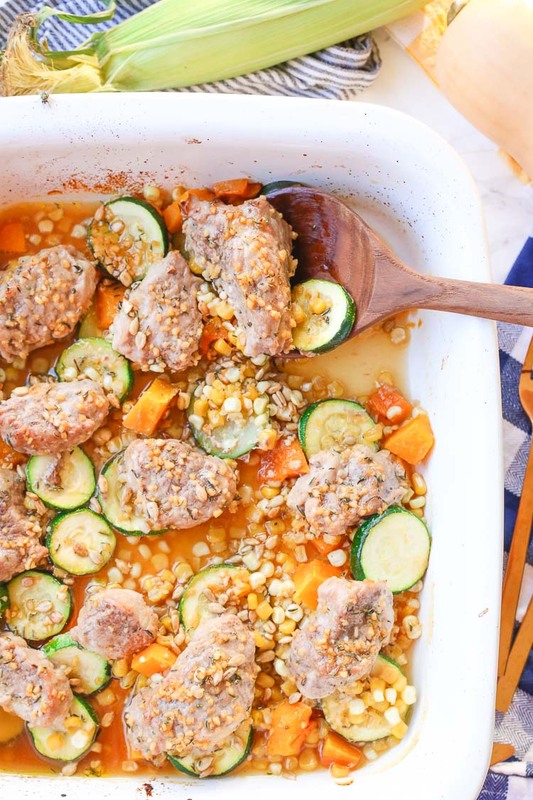 It’s a great weeknight dinner for busy families. 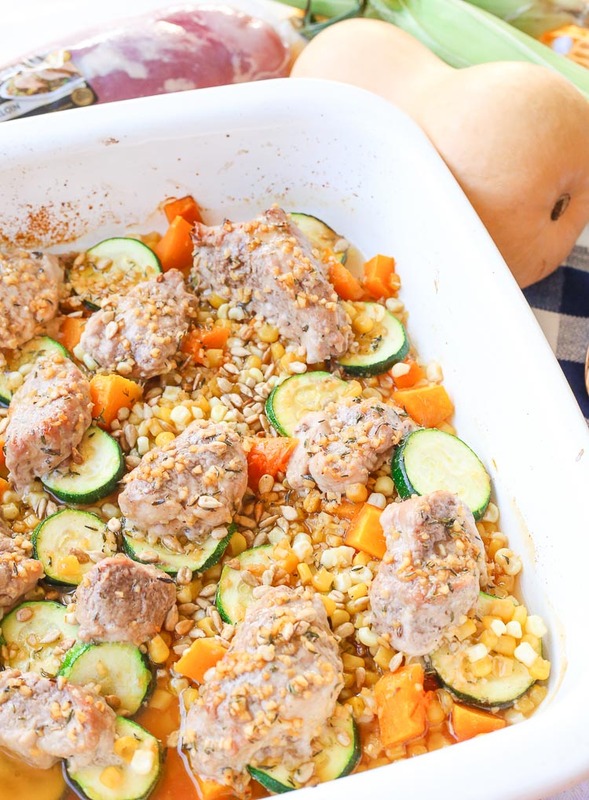 I like to use Smithfield® Marinated Fresh Pork in my recipes because it’s a perfect and easy meal solution for any night of the week and creates “Real Flavor Real Fast”. It’s also available in a variety of flavors across Tenderloins, Loin Filets and Roasts at Walmart so it’s so easy to get my hands on. 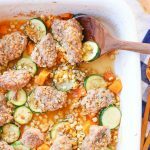 Any of the Smithfield® pork options would be good in this recipe but I chose to use Smithfield Original Recipe Loin Filet. I cut it into 1 inch medallions and placed them on top of a bed of fresh chopped autumn vegetables and then drizzled a sauce made up of honey, garlic, and lime juice on the very top. Because I sliced the pork loin into medallions, the meat is cooked quicker for a quick meal in about 30 minutes! 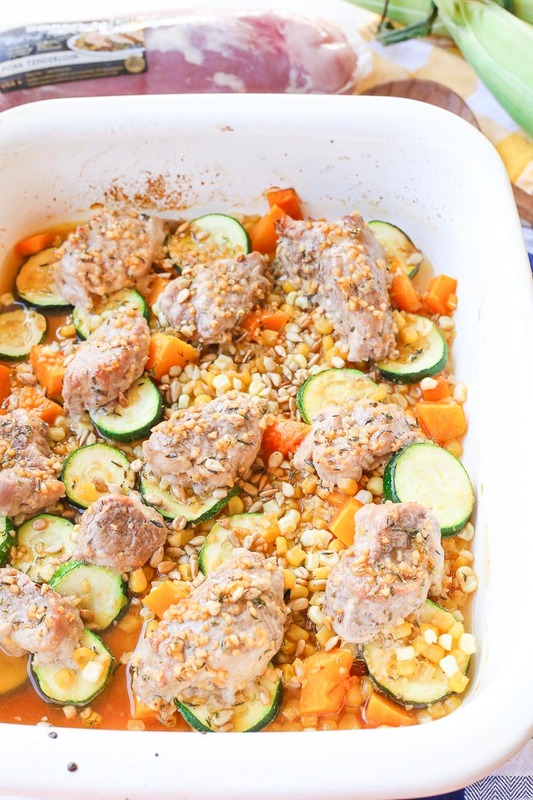 Preheat the oven to 425*F. Add the vegetables and pork medallions in a 9 x 13 baking dish. In a medium mixing bowl, combine all the honey garlic sauce ingredients and mix well. Drizzle the sauce over the vegetables and meat and cook for 20 minutes. 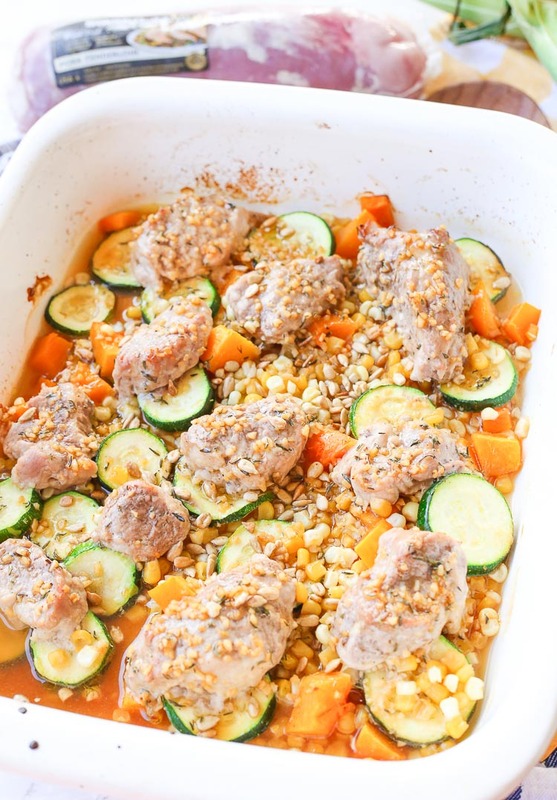 Sprinkle a handful of sunflower seeds over the top of the dish and roast for another 5-10 minutes or until the internal temperature of the pork has reached 150*F. Remove from the oven and allow to cool for 5 minutes before serving. Enjoy! 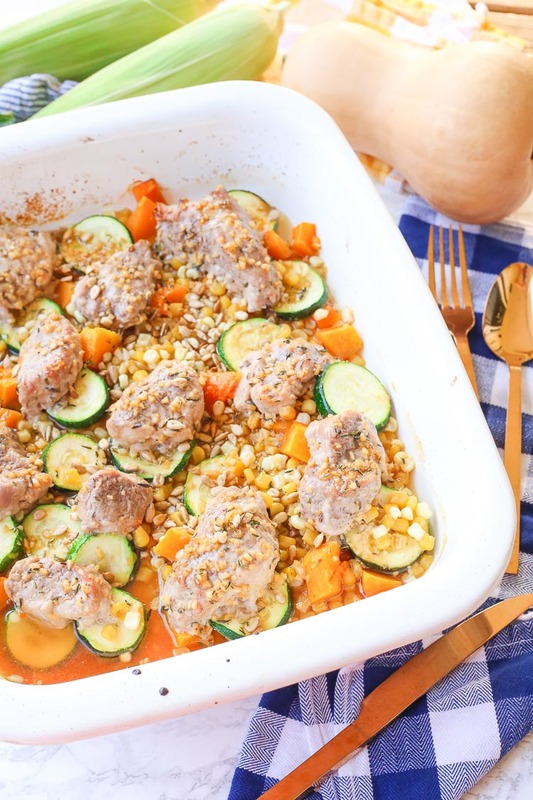 I loved the mix of fresh corn kernels, zucchini pieces, and cubed butternut squash that I picked up from Walmart to go with the Smithfield® pork. The sweet pops of the corn blend amazingly with the smooth nutty flavors that the roasted butternut squash produces. And to top it all off I like to sprinkle a handful of sunflower kernels on the very top in the last few minutes of roasting. It makes for a beautiful golden brown color and the roasted kernels add a bit of crunch to the dish. 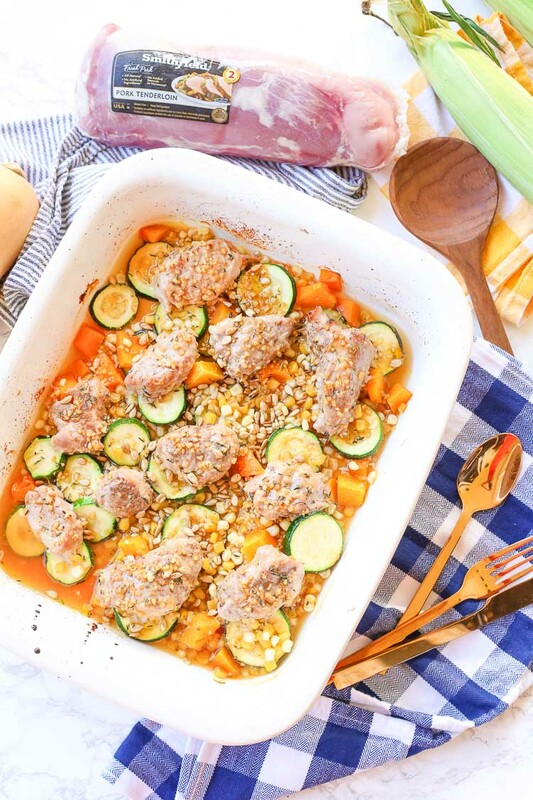 Repurpose this roasted honey garlic autumn pork and vegetables dish into a second meal, tomorrow’s lunch! Put any leftovers on a salad, turn it into pork tacos, or burrito bowls! It’s a great way for busy families to save time and have healthy meals on-the-go. Go to the Smithfield® Real Flavor Real Fast link below for a chance to win a Trip to Wine Country or thousands of gift cards! Are you in need of a weekend getaway? Smithfield® is here to help you and a guest experience the ultimate luxury trip to the renowned Napa Valley where you will get the chance to experience all that Wine Country has to offer! 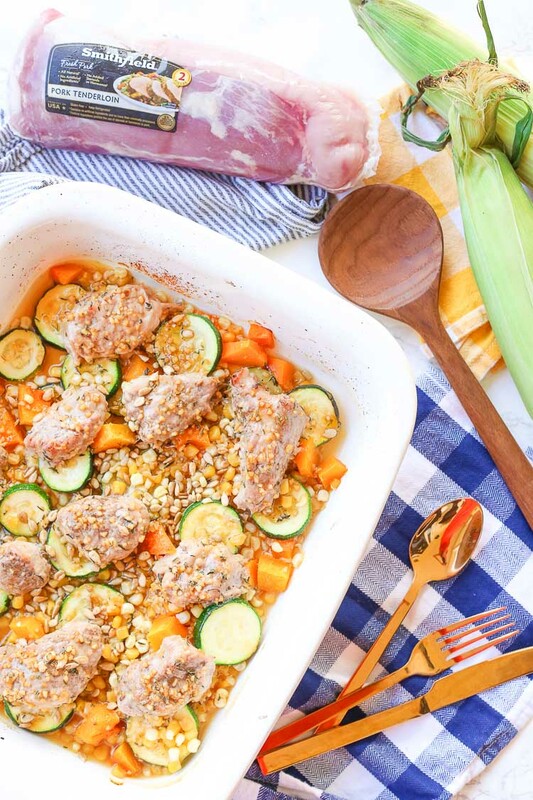 All you have to do is head on over to SmithfieldRealFlavorRealFast.com and submit your tip/trick on how you get dinner ready in 30 minutes or less using Smithfield® Marinated Fresh Pork.